Stalin's American Spy tells the remarkable story of Noel Field, a Soviet agent in the US State Department in the mid-1930s. Lured to Prague in May 1949, he was kidnapped and handed over to the Hungarian secret police. Tortured by them and interrogated too by their Soviet superiors, Field's forced 'confessions' were manipulated by Stalin and his East European satraps to launch a devastating series of show-trials that led to the imprisonment and judicial murder of numerous Czechoslovak, German, Polish and Hungarian party members. Yet there were other events in his very strange career that could give rise to the suspicion that Field was an American spy who had infiltrated the Communist movement at the behest of Allen Dulles, the wartime OSS chief in Switzerland who later headed the CIA. Field was ideally suited to the Communists' show trials; he had known and assisted many highly placed officials, including resistance fighters and members of the Spanish International Brigades with whom he had maintained contact after the war. In addition, he had had contact with Allen Dulles which allowed the Communists to construct a scenario of cooperation with the U.S. directed against the Soviet bloc. It could even be argued that Field had turned his friends into a spy network penetrating Central Europe. Moscow could thus counteract the ongoing uncovering of its own network in the U.S. with the bogus uncovering of an extensive network of American spies headed by the same Field whom the U.S. had charged with being a Soviet agent. Never tried, Field and his wife were imprisoned in Budapest until 1954, then granted political asylum in Hungary, where they lived out their last years. Noel Field remained a staunch communist; his final testament, written in Budapest and published in an American political journal, was entitled "Hitching Our Wagon to a Star". In 1956, just out of prison, he had published an angry defence of the Russian counterrevolutionary brutality in Hungary. Noel Field died in 1970. This new biography takes a fresh look at Field's relationship with Dulles, and his role in the Alger Hiss affair. 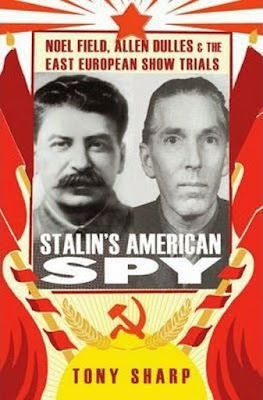 It sheds fresh light upon Soviet espionage in the United States and Field's relationship with Hede Massing, Ignace Reiss and Walter Krivitsky. It also reassesses how the increasingly anti-Semitic East European show-trials were staged and dissects the 'lessons' which Stalin sought to convey through them.